If Gmail is set to auto sign in on your browser, then you should be taken straight to the Contacts List page or otherwise you should manually log in with your Gmail password. 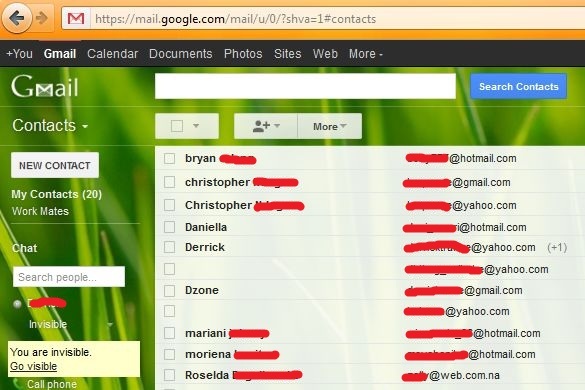 To access Google Contacts from your Gmail account, you must first log into your Gmail account. Go to the login page and enter your username and password. 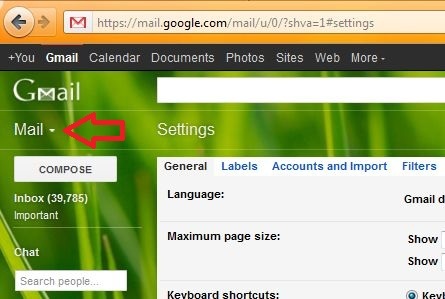 When you are inside your email account, go to [Mail] at the top of the left side bar just below the Gmail icon. Click [Mail] and go to [Contacts] on the drop-down menu. 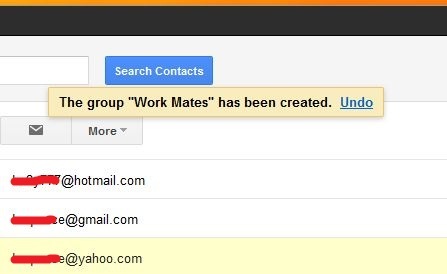 This will take you to the Contacts List page https://mail.google.com/mail/u/0/?shva=1#settings where you can manage your contacts. Note that this page will show your background theme if you have one. The 3 tabs at the top of the Contacts page, [Add to My Contacts], [Groups] and [More] allow you to manage your contacts. This allows you to add new contacts. Click the small arrow on this tab to open up a form. Type in the email address of the contact you want to add. If you have had previous email correspondence with this person, Gmail will generate auto suggestions for you just by typing the first letter of the name of the person or email address. Select the appropriate email address from the drop down list and click [Add] at the bottom left of the form. 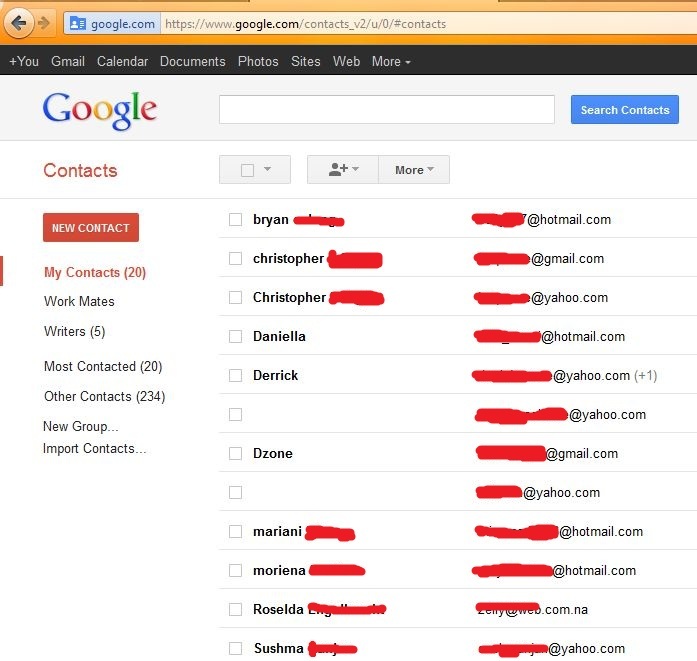 You should now see the person name and email address in your Google Contacts List. The “Groups” tab allows you to create more groups other than the “My Contacts” group. 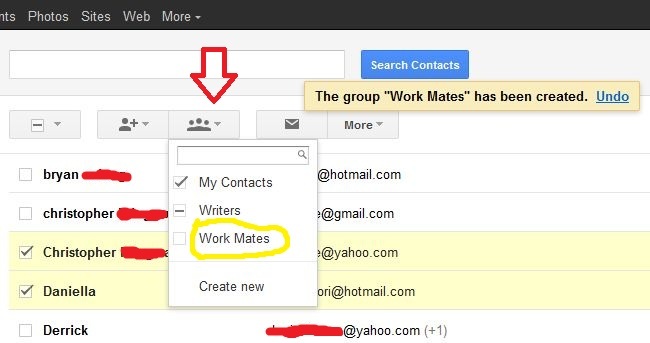 In the example below, 2 new groups “Writers” and “Work Mates” have been added to the Groups. To create a new group, simply click the small arrow on the Groups tab to open up a form. Type in the name of the group and click [Create New] at the bottom of the form. The [More] tab allows you to Merge Contacts, Delete Contacts, Import Contacts, Export Contacts, Print Contacts, Find & Merge Duplicates, Restore Contacts and Sort Contacts by first name or last name. To delete a contact, select the name of the contact on the list by ticking the box against the name. Click the small arrow on the [More] tab and select [Delete Contact]. 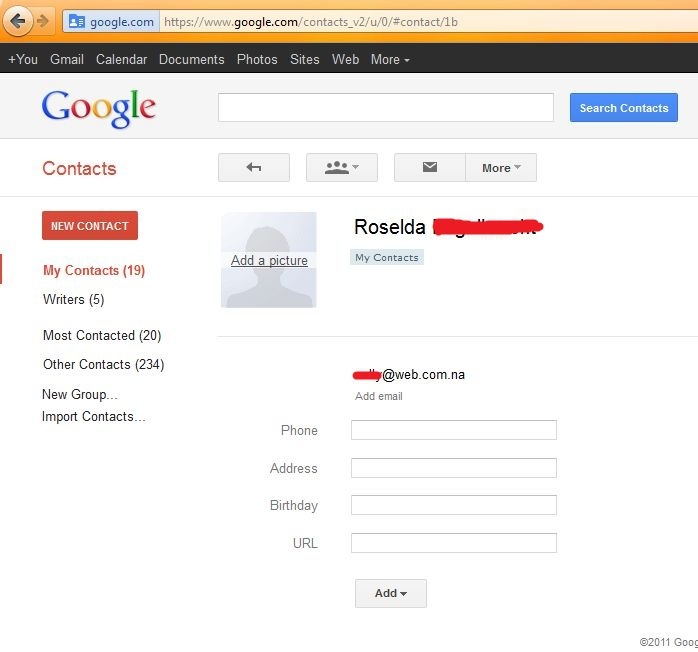 To export Google Contacts, select the names of the contacts that you want to export by ticking against the names. Click the arrow on the [More] tab and select [Export].You should see a form like the one below. Choose your options [Selected names] or [Groups] or [All Contacts] as well as the export format and click [Export]. 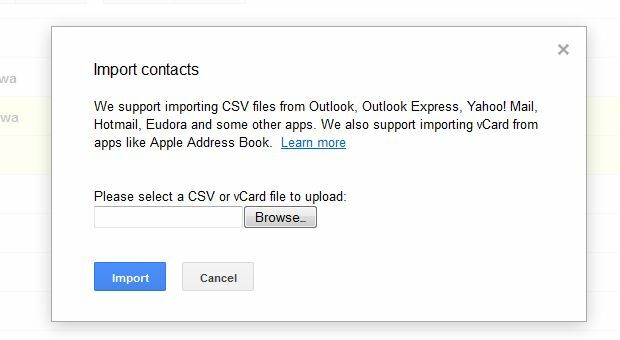 To import contacts from another email account into your Gmail account, you should go to the [More] tab, click the small arrow and choose [Import].First you must download a CSV file from an email account that you want to import contacts from. This CSV file contains the contacts. Download it to your computer, and upload it into your Gmail account via the “Import Contacts” feature. Gmail supports CSV files from YahooMail, Hotmail, Outlook Express and others. You can also upload a vCard from an Apple Mail address book. Browse to the location of the CSV file on your computer and click [Import]. You can print contacts in your Gmail account to PDF or printer. Select the contacts you want to print on the Contacts List. Place a tick against the names and click the small arrow on the [More] tab. Choose [Print] from the drop down menu. An options box should pop out. Choose your options and click [Print].You have 3 options. You can print [Selected names], [Groups] or [All Contacts]. Did you delete your contacts and you want to restore them again? 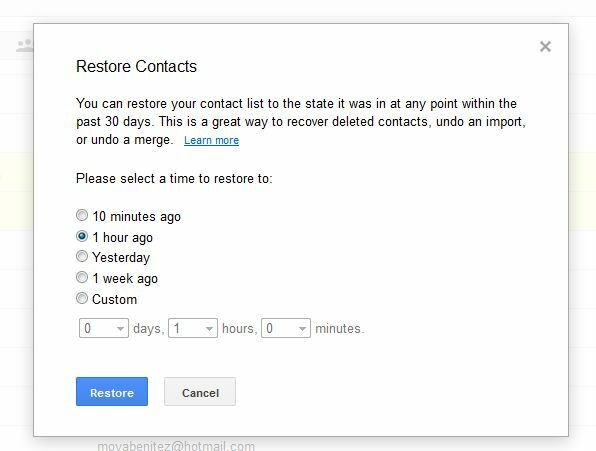 Gmail allows you to recover your deleted contacts to their original state within 30 days from deletion. This feature will also unmerge and remove imported contacts. To restore deleted Google contacts, go to the [More] tab, click the small arrow and choose [Restore Contacts] from the drop-down list. On the form that pops up, select a restore point from the time that the contacts were deleted i.e. 10 minutes ago, 1 hour ago, yesterday or 1 week ago. To enter your own time, choose [Custom] and click [Restore]. 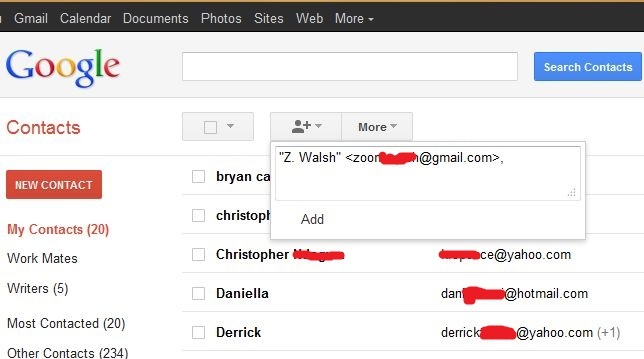 This option allows you to sort your Gmail contacts by First Name or Last Name. To access this feature, go to [More] on the menu, click an arrow and select [Sort by First Name] or [Sort By Last Name]. 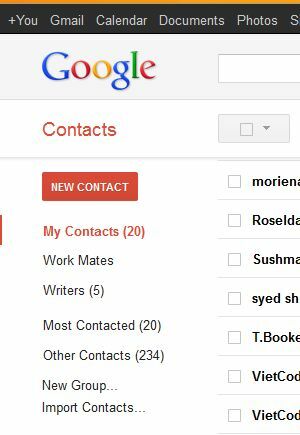 The left side bar on the Google Contacts page contains navigation links for your Contacts, Groups, Most Contacted persons and Other Contacts. It also shows the “New Contact” tab for creating or adding a new contact. The “New Group” link allows you to create a new group and you can also import contacts using “Import Contacts”. There is a search bar at the top of the Contacts page to help you find contacts in your address book. Just type in the name of the contact or email address and click “Search Contacts”. To add a picture to a Contact Profile, you should click [Contacts] then select the Contact whose profile you want to edit – Tick the small box next to the Contact name and double click the name. The system will load the profile. Click [Add a Picture] on the top left. The [Upload a Picture] form will pop up. Upload a picture from your computer, Picassa Web album or enter a URL (web address) where your picture is hosted on the internet e.g. TinyPic.Click [Upload] and the profile should now have a picture. To edit any profile in your contacts list, go to [Contacts] and tick the Contact whose profile you want to edit. Double click the contact name to load the profile. Enter the details on the form i.e. Phone number,Address,Birthday and URL.You can also change or add a picture by clicking the picture box [Add a Picture] at the top left of the page.